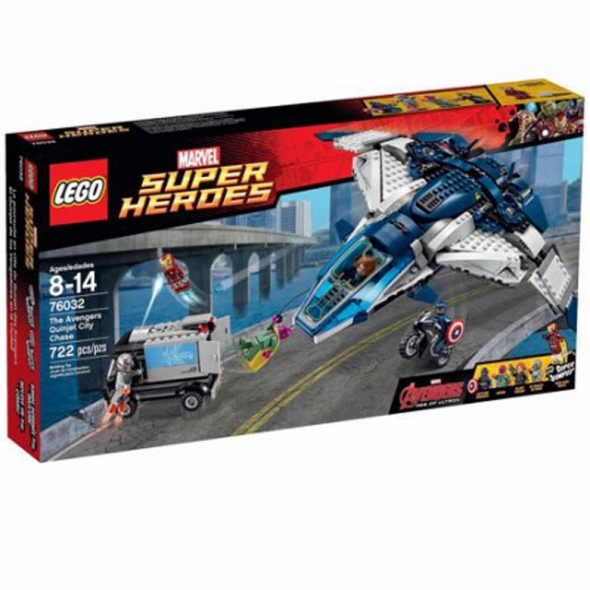 Launch a high-speed pursuit of Ultimate Ultron with the Avengers in the iconic Quinjet. Place Black Widow at the controls in the cockpit and soar into the sky. Fire the stud shooters and release Capta on his super-cool bike to take the pursuit to the streets. Iron Man MK43 is flying alongside the Quinjet using his thrusters, ready to take on Ultimate Ultron. When the time is right, make the perfect jump onto the truck to explode the sides and reveal the precious cargo.